A few days after Gary passed away, my son in law Joe’s grandmother passed away. He had to head to Pennsylvania. His father had no one else to lean on. He felt so bad about missing Gary’s Life Celebration on the 6th, but you gotta do what you gotta do. Two days before Gary passed away, a good friend of ours passed away. We had his celebration at the Railroad Museum in Wilmington. He loved trains and collected model trains. It was the perfect place. I was floored to see his brothers and wives and his mom and sister walk into the museum. We are having a memorial in PA in October, so I thought they would not come down. It was a wonderful surprise. Samantha just took over and planned the whole thing. I got a message from my cousin in California that her husband passed away on the 10th. Monday I turned 65. It was the first birthday in 43 years that I celebrated my birthday without Gary. For my birthday I adopted the sweetest little dog. I named her Gracie. She is the first female dog I have had. She was spayed yesterday and I picked her up late in the afternoon. 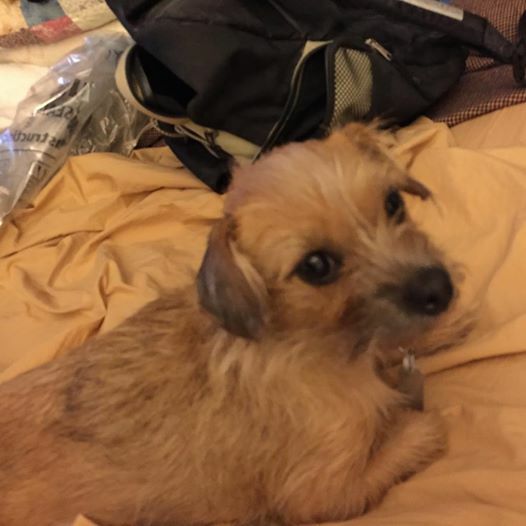 Gracie is a Cairn Terrier Mix and weighs 8.5 pounds. Gracie is setteling in nicely. We got home about 7:30 on Monday night and I noticed that my air conditioner unit was running and running with no air coming out of the vents. You guessed it. The unit is shot. The guy was here today and he just shook his head and said I hate to give you bad news but……So a new unit is about 7 grand. You can believe I have had a few conversations with Gary over this. I haven’t done much reading the past couple of weeks. I hope to get back into that soon. I am also looking forward to getting back to quilting. My grand kids want new quilts.